This week I was away doing a new work trip installing and training of some 3D related technology in a location near Landstuhl, Germany. This was my first visit to Germany. Frankfurt airport is one big airport; and there was lots of building work going on inside of it. This trip begun on Monday and I was back late Wednesday evening. No flight delays or lost luggage this time. 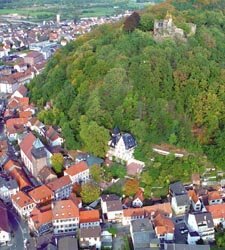 This is an aerial view of Landstuhl.